KULA — Upcountry residents continued to angrily question officials with the state Department of Health this week about recent studies that identified their neighbor-hoods as a top priority area for cesspool contamination of drinking-water wells. 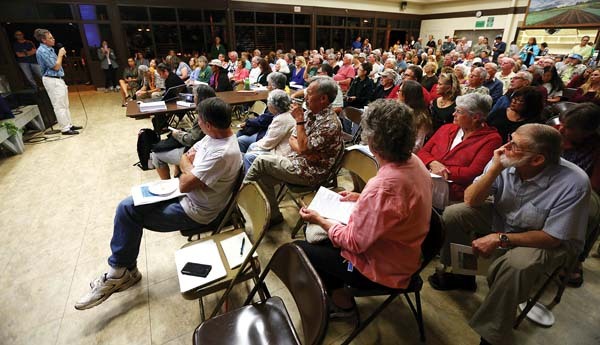 Many of the more than 150 residents who attended Wednesday night’s presentation at the Kula Community Center were still emotional after meeting with the department last month over the issue. 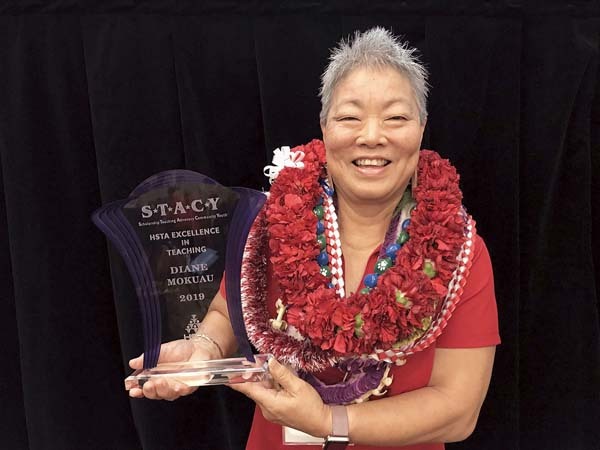 Upcountry has 7,400 cesspools that health officials deemed potential threats to drinking water, and a new state law requires residents to replace them with a septic tank or hook up to a sewer system by 2050. Removing each cesspool could cost about $20,000, which residents say they cannot afford. The cost to upgrade all of the state’s 88,000 cesspools is estimated at $1.75 billion, according to the department. Robert Whittier, a wastewater hydrogeologist, presented the department’s Upcountry water quality investigation during the meeting and identified two wells with elevated nitrate levels, which are chemicals found in fertilizer and sewage: the Baldwin Ranch Estates Well and the Pukalani Golf Course Well. The Baldwin well located below Haliimaile Avenue recorded levels up to 8.9 milligrams a liter and serves as a drinking water source for a new development. The Pukalani well recorded levels up to 6.8 mg/L and was sampled to evaluate water quality for a proposed development. The legal limit is 10 mg/L, but the normal concentration in Hawaii aquifers is less than 3 mg/L, Whittier said. He added that levels greater than 5 mg/L trigger increased monitoring. “Our concern is we have these wells with high nitrate, and they are in an area where we have a lot of” cesspools, Whittier said. Health officials clarified the water is still safe to drink, but it can be fatal for infants if levels exceed 12 mg/L. Elevated nitrates also pose a threat to the ocean environment, causing accelerated algae and plankton growth. Whittier explained that the investigation ruled out other possible nitrate sources such as former sugar and pineapple cultivation as well as nearby livestock. He also presented a computer model that supported the report’s findings. Health officials concluded in the investigation that Upcountry needs to reduce the maximum groundwater nitrate levels by about 25 percent. Nitrate removal from cesspools appears to be minimal based on groundwater data, but a septic tank would remove about 30 percent along with another 25 to 60 percent via a leach field. Wastewater Branch Chief Sina Pruder said the department would not be prescriptive or identify one solution for all properties. She noted, though, that Upcountry’s silty clay soil works well with leach fields. “Upcountry typically has good soil so a septic tank with a leach field would most likely be good to reduce nitrates,” Pruder said. While the department’s investigation looked at livestock and former crop cultivation, Upcountry residents asked about other possible sources of pollution that may have contributed to the Baldwin and Pukalani wells. “It seems to me in both of those cases you have significant sources of domestic wastewater that is receiving — in one case pretty minimal treatment, and in the other . . . something like 200,000 gallons of (treated) wastewater a day,” O’Keefe said. Pukalani resident John Tavares asked if the department considered old dumps near the Baldwin well that existed from the 1950s to 1970s. He said one of the dumps was filed with over 200 feet of trash. Whittier acknowledged he was not aware of the old dumps, but clarified that there are more wells impacted than the Baldwin well. Deputy Attorney General Edward Bohlen, who represents the department, reiterated to the crowd that the state is not “singling out Upcountry Maui” or mandating a solution. He said there is a perception that the department is forcing residents to upgrade to septic tanks. “We don’t know necessarily what the best technology is, and we don’t know the best financial solution,” Bohlen said. “We’re opening up a process including meetings like this to find out what the community is concerned about and then bring in expert opinions about the best way to bring nitrate levels down. Several state and county lawmakers attended Wednesday night’s meeting, including Upcountry state Rep. Kyle Yamashita. Yamashita said the Legislature is juggling five bills in the House and a couple in the Senate that include subsidizing cesspool upgrades and putting together a task force to come up with a solution.